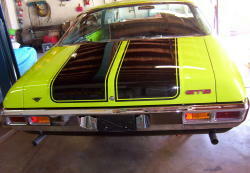 1972 HQ Holden GTS Monaro PG 2. 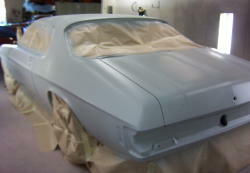 The car in primer prior to painting. 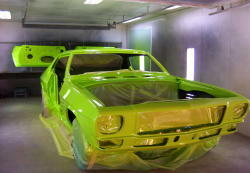 After painting, the colour is barbados green and was an original colour offered by Holden. 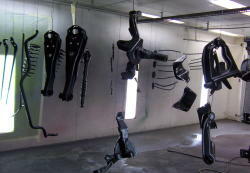 Painting the susdpesion components. Refitting the suspension, new bushes and joints were fitted. 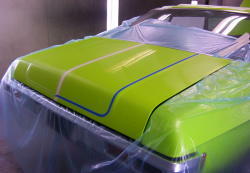 Masking out the stripes. Stripes painted and rear end fitted up. 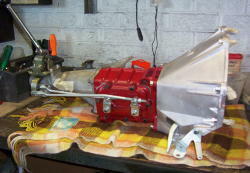 A M-24 4 speed manual transmission was sourced and fitted in place of the Trimatic automatic transmission. 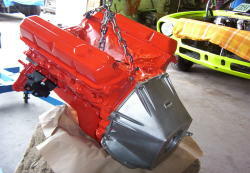 Rebuilt engine after painting.